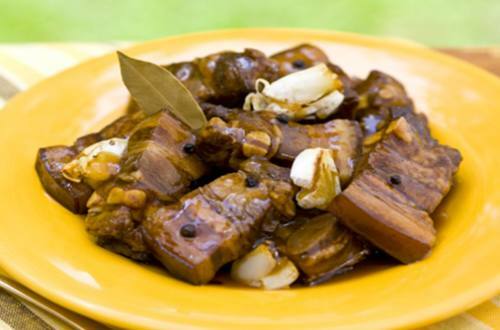 With Knorr Liquid Seasoning, Pork Adobo never tasted this good! 1 Get a pot and make it nice and hot over medium heat. Pour some oil and saute garlic and onions. Add pork and continue sauteing until cooked. 2 Pour Knorr Liquid Seasoning, water, vinegar, laurel leaves, sugar, and pepper. Bring to a boil and reduce heat to a simmer. Cook for 10 more minutes and turn off the flame. 3 Drain the meat and fry. 4 Return the fried meat in sauce. Reheat and simmer until sauce thickens. 5 With hot rice, you will find yourself eating more than usual.